If you need a car air conditioner repair service in Covina, then you are definitely going to want to schedule an appointment with our team, and not just because there is nothing worse than sweating uncontrollably in a hot car. Getting reliable AC car repair service is only possible when you are going to professionals armed with the proper skill, knowledge, and experience in auto repair, and that is something that each and every technician here at Johnny’s Auto Service is able to declare with certainty. We offer the highest standard of work for our customers, from routine maintenance to major repairs. Like virtually any part of a vehicle, your car’s air conditioning will degrade over time, and will occasionally be in need of a proper auto AC repair or maintenance service. There are several symptoms that your car air conditioner needs repair in Covina, including not adequately cooling the inside of the vehicle, not working at all, blowing warm air, a foul smell emitting from the AC vents, and a grinding noise when the AC is turned on. 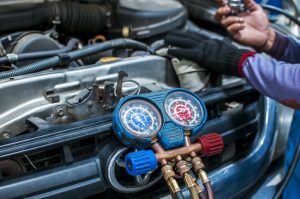 Whether it is a broken fan, or you are simply low on refrigerant, our team of ASE Certified Master Technicians will be able to properly diagnose and fix whatever issue may be causing your car’s air conditioning to malfunction. It can get extremely warm in Southern California. A broken air conditioner in your vehicle can be uncomfortable as well as dangerous for small children, elderly people, and pets. Stop suffering from the abhorrent cabin temperatures that are a result of a faulty air conditioning system. Get the best car air conditioner repair in Covina by giving us a call at (626) 966-5212 and scheduling an appointment today! Our experienced team looks forward to fixing your AC and getting you back on the road in a cool car!